Director – Griff Furst, Screenplay – Geoff Meed, Producer – David Michael Latt, Photography – Alexander Yellen, Music – David Raiklen, Visual Effects – Wil Braithwaite & David Michael Latt, Special Effects – Roger George Rentals, Makeup – Tara Lang, Production Design – Andrea Rennard. Production Company – The Asylum. Renchard is the lone survivor of a plague that has wiped out humanity. Living in a house in Oxnard, California, he must fight off the survivors who have been turned into zombies by the infection. One day, he unexpectedly receives a video call from a girl barricaded up downtown, begging for him to rescue her. He ignores the call, believing it to be a hallucination caused by loneliness. Two former soldiers then arrive from Antioch, a community of survivors, and force Renchard to lead the way to rescue the girl, wanting her because her blood holds an antidote to the plague. During the rescue, Renchard discovers the men are not who they claim to be, while the zombie hordes throw their plans awry. I Am Omega is one of the ‘mockbusters’ from The Asylum – films with sound-alike titles designed to copy other big-budget hits that come out of recent in the hope the people browsing videostore shelves do not look too closely at the title. Other mockbusters from The Asylum include their own cheap versions of War of the Worlds (2005), Journey to the Center of the Earth (2008), Sherlock Holmes (2009), 3 Musketeers (2011), Grimm’s Snow White (2012), Hansel and Gretel (2013), Jack the Giant Killer (2013) and Hercules Reborn (2014) when the respective big-screen versions came out, and other soundalike titles such as The Da Vinci Treasure (2006), Snakes on a Train (2006), AVH: Alien vs Hunter (2007), The Hitchhiker (2007), Transmorphers (2007), Allan Quatermain and the Temple of Skulls (2008), The Day the Earth Stopped (2008) 100 Million B.C. (2008), Sunday School Musical (2008), The 18 Year Old Virgin (2009), Battle of Los Angeles (2011), Abraham Lincoln vs. Zombies (2012) and Age of the Hobbits (2012). The titles each of these are playing off should be self-evident. In this case, I Am Omega came out a month before the big-budget Will Smith film I Am Legend (2007). I Am Legend was in turn a remake of the earlier The Omega Man (1971) and before that The Last Man on Earth (1964) with all of them being based on the Richard Matheson novel I Am Legend (1954). Clearly, The Asylum have borrowed the title from The Omega Man and combined it with the name of the novel. The original novel and the first film are about the last man on Earth facing off against vampires who imprecate him to open his door and come out to them. Both The Omega Man and the 2007 film changed the vampires to mutants for reasons unknown so it is not too much of a stretch to go from that to zombies lurking outside the door. I Am Omega replicate the basics of I Am Legend as much as copyright allows. There is the lone survivor holed up in his home, fending off against infected people turned into zombies lurking outside (which is actually closer to the original Richard Matheson novel than the 2007 film came – even if the idea of lurking zombies never quite captures the chill idea of vampires begging the last man to come out to them). Thereafter, I Am Omega tends to be a B-budget action/zombie film. 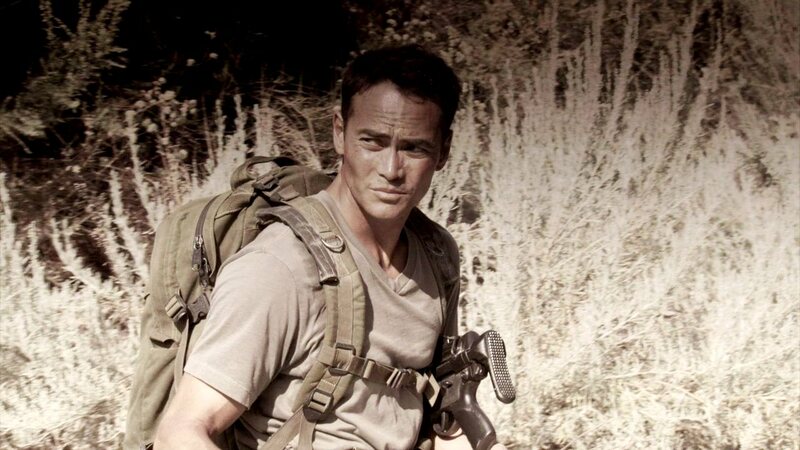 Richard Matheson’s last man on Earth is recast with martial artist/actor Mark Dacascos and made into a by-the-book muscular, weapon-toting action hero. The script feels decidedly underwritten – there is never any explanation offered of the zombies or the downfall of civilization, at most the suggestion of some type of infection. There is no clear reason offered why Mark Dacascos has planted explosives all around the city other than to give the story some drive with him having to get out before they detonate. Although, when you see the size of the explosives that Dacascos is planting, they seem barely enough to blow up a single garage let alone an entire city. For all that I Am Omega is an action film, not much happens. Things eventually start moving after around the halfway point where there are some passable if low-budget action scenes and some moderate zombie splatter. Some of the more effective scenes are when Mark Dacascos cannot be sure whether the video messages he is getting are real or hallucinations produced by his loneliness. Unfortunately, Mark Dacascos is not the world’s most expressive actor and fails to give much conviction to the scenes of him going crazy. Certainly, the film comes to life a good deal more when the redneck soldiers (the lead one being played by screenwriter Geoff Meed) enter the scene. Both Meed and Ryan Lloyd give decent performances here and bring the characters to life. One of their more amusing pieces of writing is their motivation where they want to capture Jennifer Lee Wiggins in order to stop the Antioch scientists developing an immunity, as a restoration of civilization will destroy the survivalist fantasy they have. Director Griff Furst is better known as an actor. He has appeared in everything from Boa vs Python (2004), a number of films for The Asylum and Active Entertainment, as well as parts in more respectable studio films like Green Lantern (2011), Battleship (2012), Self/less (2015), Terminator Genisys (2015), The Founder (2016) and The Magnificent Seven (2016). He has directed several films, including Universal Soldiers (2007) and 100 Million B.C. (2008) for The Asylum, and 30 Days to Die (2009), Lake Placid 3 (2010), Maskerade (2011), Swamp Shark (2011), Arachnoquake (2012), Ghost Shark (2013), Ragin Cajun Redneck Gators (2013), Starve (2014), Cold Moon (2016), Trailer Park Shark (2017) and Nightmare Shark (2018) for other companies.